I have to say I have a bit of an interest in aero dynamics (on a novice/superficial level) and found the above link really interesting reading. Taking this as a basic (and having no real qualifications in fluid dynamics etc) I was wondering whether there could be anything to be taken from the above link that could be applied to a road-going Mini. 1) under bonnet - I think the positive lift measured at the front of a Mini is largely due to the enormous grill area gobbling up huge amounts of air that can't go anywhere forcing it to go under the car (a bad thing). Racers vent their A-panels but it ain't pretty, usually a few round holes. Thoughts to reduce the lift. Firstly blank off part of the grill to restrict air being ingested. With a 16v Mini we tend to have a front mounted rad in front of the gearbox so this needs to be open. Engine will need cooling so some air will need to get in just to try and replace the hot under bonnet air. The air going in to the grill has to go some where. Going under the car is a bad thing so firstly the subframe needs a belly pan to cut the air going under the car. Wheel arch liners will help air getting dragging in or out of the wheel arch and will channel air to back of wheel well. Controlling this air needs some thought and I think channelling it as smoothly as possible down along the doors would reduce drag if hot turbulent air just being expelled out of holes in the A-panel so a duct would be needed behind the wheel arch to turn the air and direct it down the side of the car. It might also be worth adding a duct of sorts behind the rad to channel the hot air directly to the wheel well rather than just in to the engine bay. 2) Reverse air flow at base of screen - According to that link the old trick of raising the bonnet doesn't let the hot air as the base of the screen causes the air to try and flow back along the bonnet. ERA knew this and the bonnet "vent" on the trailing edge of the bonnet is not to let hot air out but to take advantage of this reverse flow and draw cool air directly on to the plenum and turbo. My thoughts is could a similar "vent" this be used to draw cold air to an air filter box under the bonnet ? 3) Under body air flow - Generally the rule seems to be to stop as much air from going under the car as possible. Short of running the car dropped to the weeds a discreet front splitter would help separate the air and minimise the amount going under the car. This could be integrated into the belly pan mentioned above. I'm not one for body kits but I could be persuaded that a discrete but functional side skirt could be worth fitting. to stop air being sucked under the sides of the car. The undersides of the car are quite uneven so perhaps a sort of flat floor either side of the Transmission tunnel could be matched to the front belly pan and the side skirts. Small returns on the sides of the flat floor panels should encourage the air to stay under the car also. Those are my thoughts for a complete aero package for a classic Mini - probably overkill for a road car and more applicable for a road-going trackday car. What are peoples thoughts on the above ? Last edited by Oz; 17-09-2018 at 04:29 PM. ^agreed with Gazwad on that one. That said, I'd have guessed the biggest improvements would be from the flat(er) floor (including engine undertray) and tie in the rear valance. .... or a roof chop? Personally I think the under bonnet venting through the A-panels and not under the car and restricting the amount of air getting in through the grill in the first place would be the most important of the things mentioned as this reduces the natural lift at the front of the Mini. 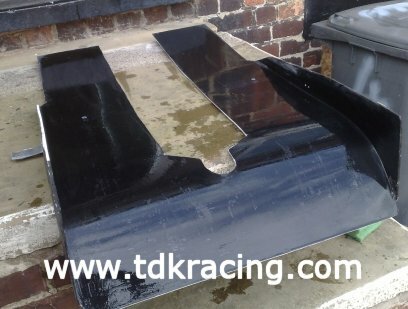 The Underfloor smoothing doesn't add "downforce" but it just reduces drag by minimising the turbulence under the car. One other thing I read was what on first glance seems counter-intuitive but actually makes sense, is to have an aperture smaller than your rad to duct air into the rad. It would seem that maybe grabbing as much air as possible and forcing it in to the rad would give better cooling but what actually happens is that the rad is a big restriction and as air will always take the path of least resistance it will find somewhere else to go. By creating a smaller aperture the air entering it spreads out in to area between the aperture and the rad and as the area is greater behind the aperture than in front of it the air slows down and spreads out and that helps the air to go through the rad more effectively ! Obviously you need to effect a sort of seal from the rest of the engine bay else the air would still just bleed around the rad instead of going through. True, that makes sense. If you block most of the grille you're going to get a build up of heat from the engine and manifold which will sap power unless you have a cold air feed to your intake. I don't know how much of an effect on water and oil temps that would have either... I know mine's boarderline in hot weather with an ally rad and 12" fan. That's where venting the A-panels comes in, as long as the flow through the grill is less than the A-panel vents can dispose of then you can keep a flow of cold air going through the engine bay to help keep under bonnet temps down, along with heat wrapping or ceramic coating the exhaust manifold. That's the theory anyway. You wanna get yourself this book... race car aerodynamics by Joseph Katz full of lots of useful information.